Teaching is a challenge, but no matter what STEM subject your class is involved in, Chicago can help with field trips your students are sure to remember for years to come. 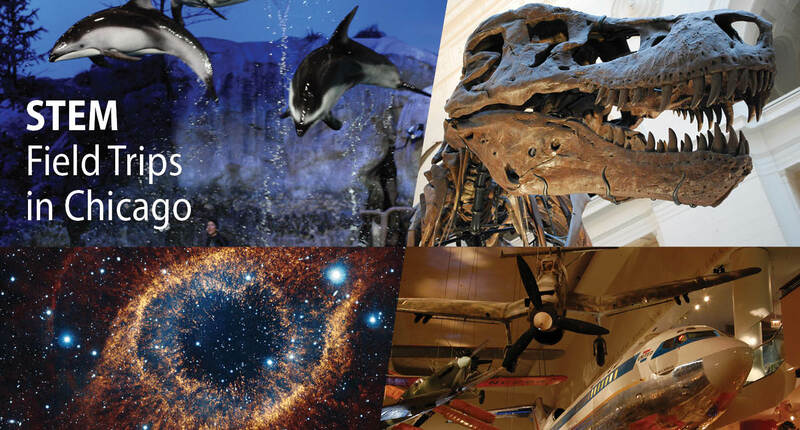 From a million years ago to the future of the universe and everything in between, consider these four amazing possibilities — each with programming for students in pre-K through grade 12 — for a STEM field trip in the Windy City. Possibility #1 — The Museum of Science + Industry, Chicago holds an incredible array of interactive scientific exhibits, events, tours, and movies that bring science rushing at students with such clarity that they cannot help but learn. By experiencing spectacles like taking to the sky in a flight simulator, watching the Story of Earth unfold in the Giant Dome Theater, or designing and fabricating items from scratch in the Fab Lab, students will be immersed in STEM from the second they walk in the door. For example, what could be more intriguing than the mystery behind a real captured WWII German U-boat the Nazi’s thought was sunk but is now in the museum? Or how about taking a 4D virtual walk outside the International Space Station? There’s a constantly changing menu of things for kids to do, see and try, so find out more and plan your field trip to remember. Possibility #2 — Shedd Aquarium defies the imagination with its beauty. The many exhibits and programs teach children to value and respect underwater creatures while they instruct about what each of us can do to help conserve and protect aquatic life. Shedd’s field trip has learning programs with interactive and hands-on activities geared to each age group. Programs include Science Tech Treks for grades K-2 and 3-5 with “dynamic exhibit-based” adventures in the aquarium, and Learning Labs for grades 6-8 and 9-12 that include activities like squid and fish dissection. Early-grade programs also provide field trip preparation and follow-up resources; learning lab guides are provided for older grades. Shedd Aquarium is a rich experience for kids of all ages so find out more for your next amazing STEM field trip. Among the many exhibits that will enthrall students and adults alike are Plants of the World, Meteorites, Grainger Hall of Gems, Ronald and Christina Gidwitz Hall of Birds, Pawnee Earth Lodge, and the DNA Discovery Center, to name a few. The museum’s Out-of-State Field Trip Planning Packet has everything you need to register your group for an amazing field trip that won’t soon be forgotten. Adler also provides a range of field trip exhibit guides to help teachers promote age-appropriate learning in varied exhibits. Guides include highlights of each exhibit and “find-do-ask” exercises that engage students while teaching them fundamental and fascinating facts about the solar system, the universe, telescopes, our planet, and astronomy and culture. Guides are also available for different domed theater shows, including “Planet Nine,” “Cosmic Wonder,” “Skywatch Live,” and more. Find out about field trip options by grade level and book your group for an out-of-this-world field trip. Chicago has so much to offer teachers and students, and Indian Trails is ready to help make your field trip a huge success. Our charter drivers are top notch and our new motorcoaches have all the latest comforts and amenities. For more field trip ideas and help, read our blog, "How to Plan a Successful Field Trip." To learn more about Indian Trails charters, download our free “Professional's Guide to Bus Trips with Kids,” and start planning!